Thanks Fib for posting the chat from last week, enjoyed reading them as always. You're the best. Looking at the longer term chart, the p/c ratio ema has been in an uptrend since Oct 14, doubting the rise in the indices, and now has apparently skyrocketed higher than anytime since '08 which appears to imply that the put buyers are finally right? The put buyers have panicked, convinced beyond all doubt they are right? Chicken little sucked them in, again... and it's time to buy with both hands? So is is A, B. C? D. Where Fib was mentioning Sometime in Sept for a tradeable low? ALL very good questions Kamakaze. A very long term chart of the put/call ratio suggests that a higher fear premium was placed on the marketplace in the aftermath of 9/11 (yellow circle on the chart) which curiously has remained persistent so far. 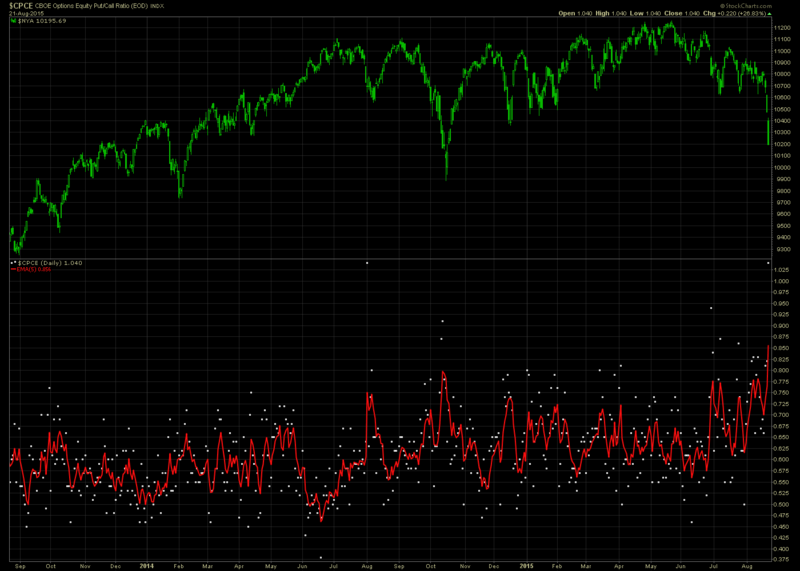 The LT PC ratio below features the 10 day sma in an area form with a bisecting HZ line at .80. 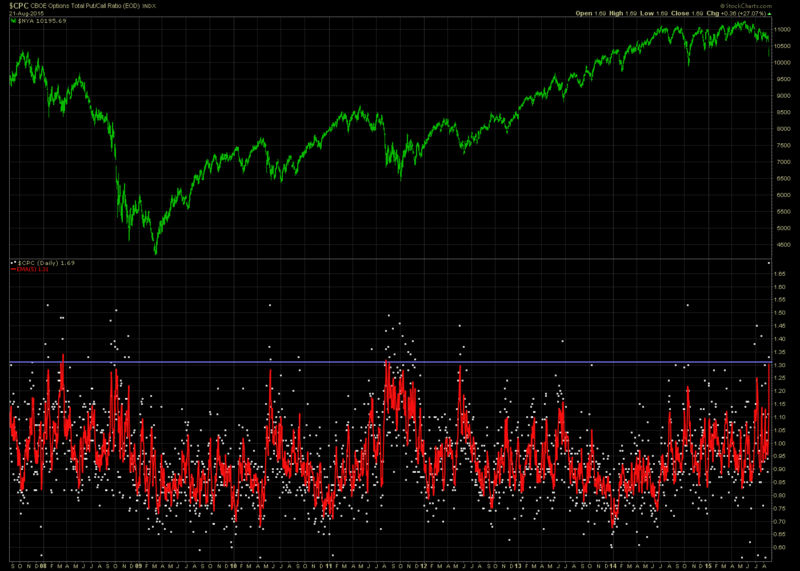 Prior to 9/11 the norm was for Put/call ratios to stay under that .80 HZ line and spike in times of stress. But it appears after 9/11 the norm has somewhat shifted above the .80 HZ line and only spike down in those rare stress free moments even though the center of gravity of that entire area chart remain at about that .80 level. I discovered that I had overlooked that high p/c dot on the chart in August '14, which, it appears, occurred before the index chart bottom in Oct 14, so is this spike signalling the eventual bottom some weeks from now? If history is any guide the 5 day ema first start rolling down before the actual bottom is made. These cpc spikes are not meant to be precise timing tool, just a measure of sentiment extremes.